If you smoke, dip or take a hit from the hookah, you’re SOL because the Air Force has severely curtailed where airmen can light up or chew tobacco. 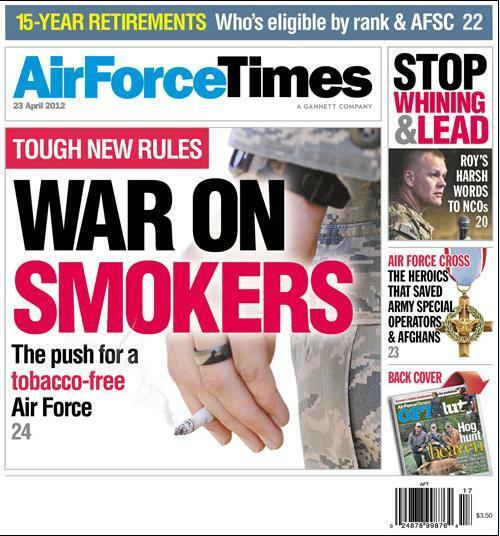 An Air Force Instruction issued in March prohibits airmen from using any tobacco products in parking lots, playgrounds and anywhere near Air Force hospitals or clinics. Nearly one-quarter of airmen smoke, and that’s higher than the national average. Still, some airmen questioned the wisdom behind the Air Force’s banzai charge against tobacco use. “Now I have to go to the smoke pit and [be]forced to inhale secondhand smoke if I want to enjoy a snus now and again,” wrote Staff Sgt. Adam Miller in an email to Air Force Times. In other matters, Chief Master Sergeant of the Air Force James Roy sent out an email recently admonishing senior enlisted leaders for peppering him with questions such as why is there no limit to the number of airmen who can get a 5 on their enlisted performance reports. The email drew angry reactions from noncommissioned officers, including one who told Air Force Times that Roy wasn’t living up to his responsibilities as the Air Force’s top enlisted leader. “The Air Force does need leadership, but that leadership is lacking starting at the top,” said the technical sergeant, who asked not to be named for fear of putting his job in jeopardy.